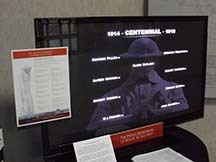 The South Dakota State Historical Society, in association with the National World War I Museum and Memorial in Kansas City, is showing a digital display called “The World Remembers” in the lobby of the Cultural Heritage Center in Pierre. “The World Remembers” is an international public memory project attempting to compile as many fatalities from all combatant nations in WWI as possible, given the availability of digitized records with this information. There is no charge to see the display, which will run until Nov. 11 and has approximately 16,455 different names appearing over a 12-hour period. The First World War, from 1914-1918, was fought on a scale never imagined. Twenty-two million military personnel were wounded and more than nine million were killed in fighting that lasted more than four years. It is estimated that seven million civilians died. The current version of “The World Remembers” features a digital display showing the names of World War I soldiers killed in the year 1918 and official war-related deaths from 1919-1922. Each soldier’s name is programmed to appear at a precise day, hour and minute. Yearly versions of the program have been running since 2014. In total, “The World Remembers” digital display for 2018 includes 1,003,167 names of military personnel from 16 nations who lost their lives during the final year and subsequent years after the war. Countries represented in the digital display include the United States, United Kingdom, Canada, France, Germany, Turkey, Belgium, Australia, the Czech Republic, Ukraine, South Africa, Italy, New Zealand, Slovenia, China and the former British Indian Army. Records provided by the National World War I Museum and Memorial list 87,873 United States soldier deaths from 1918-1922. The digital display features 1,440 American soldiers each day. Over 35,000 South Dakotans served in World War I. The “Report of South Dakota State Council of Defense” published in 1919 features a county-by-county list of more than 970 South Dakota soldiers killed during the war who received “Memorial Certificates” from the council of defense. This list of names from the report is included near the display. For more information on “The World Remembers” visit theworldremembers.org. The Cultural Heritage Center lobby in Pierre is open from 9 a.m.-4:30 p.m. CDT Monday through Saturday, and 1-4:30 p.m. on Sundays and most holidays. Call 605-773-3458 for more information about exhibits, special events and upcoming activities or visit history.sd.gov. Editor’s Note: “The World Remembers” digital display will run until Nov. 11 in the lobby of the Cultural Heritage Center in Pierre.